The Eloquent Woman: Famous Speech Friday: Keila Banks's "Undefinable Me"
Famous Speech Friday: Keila Banks's "Undefinable Me"
Keila Banks began coding at age nine and gave her first tech conference keynote at age 11, so maybe she wouldn't be too impressed to learn that she joins Severn Suzuki as one of the youngest speakers in The Eloquent Woman Index. 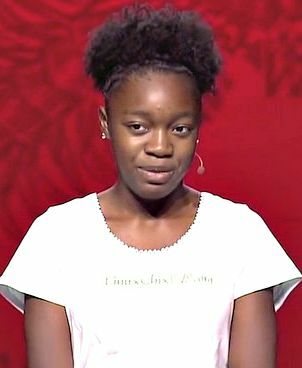 But we were impressed--along with a lot of other people, it seems--by Banks' speech at OSCON (Open Source Convention) 2015, where the 13-year old took the stage to talk about herself as the "Undefinable Me." Standing a little self-consciously with her arms wrapped around her "LinuxChix" t-shirt, Banks talked about what it's like to be a teen black girl who codes, and all the presumptions that come with that description. The talk was only ten minutes long, but Banks found a wonderful way to build a structure into the speech that turned those ten minutes into a complete story. She began with pictures and descriptions of her physical self and her home, asking the audience to consider their initial impressions of her from those descriptions. But then she fleshed out that image by describing a girl with parents who encouraged her early forays into tech, a girl who began to take on her own coding projects, and finally a girl who expanded her interests into things like cheerleading and track and field. Throughout the talk, she paused to ask the audience to again take stock of her with this new information in mind. Finally, it was lines like this that flew around Twitter and tech blogs just minutes after she left the stage: "What you see on the outside looking at me, and what I see on the outside looking at you, is not really what you are. Join me in being an undefinable you." What can you learn from this famous speech--with hopefully more to come!--by Banks? Watch what your body language is telling the audience. Banks' body language makes it clear that she is a little nervous up on stage, which is understandable at any age. She and other speakers can benefit from watching video of their speeches, to look for things like swaying and crossed arms. These elements of body language may convey a different message to your audience than the one coming out of your mouth, and even TED speakers can benefit from watching their talks with the sound off to spot these motions. You're more fluent when you speak about what you know. It's interesting that Banks' body and vocal language become less hesitant when she starts talking about how she learned programming languages like Ruby, or talking about the sites she's developed for some of her clients. These are clearly the items in her speech that she is most knowledgeable and most passionate about, and those parts of her speech are the strongest and most fluent. When you're preparing for or deciding on the topic for a speech, consider what you know the best, and think about whether and how you could include that in your talk. Don't be afraid to mix humor with serious themes. Banks' talk doesn't shy away from the racism, sexism and ageism that she can sense as a black girl in the tech world. But another part of being an "undefinable me," which she conveys so well with her upbeat speech, is expressing herself in as many different ways as she chooses. If a 13-year old girl wants to finish her talk with a slide of a popular Shia LaBeouf Internet meme, there's no one who can stand in her way.